Sean O’Casey was a prolific writer of letters. His correspondence was both deep and wide. 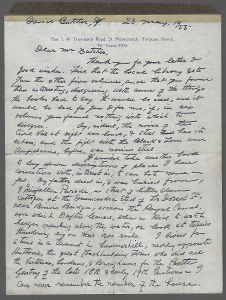 Many of his letters were ably tracked down and presented in four volumes by the US poet and academic David Krause. These books are now out of print but can still be found second-hand, and are an extraordinary work of scholarship. This story is not included in there, but is also one that deserves telling. In 1955 Sean corresponded with an amateur actor called David Butcher. David was born in Dublin in 1920, and although his family returned to England in 1922 he retained a strong connection to the country. 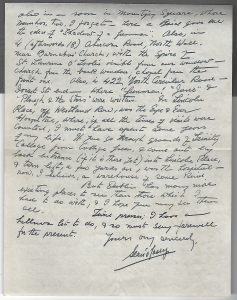 He wrote to Sean after reading Sean’s autobiography asking him about specific places in Dublin where Sean had a connection or interest. His story came to us via his cousin’s son Hugh Levey. Norman David Butcher (known as David) was the only child of English parents: Charles Edward Butcher and Ethel Butcher (née Levey). His father, Charles, worked for the Audit Department of the Midland and Great Northern Joint Railway Company, based mostly in Norfolk. In 1913 Charles was transferred to the Auditor General’s Departments in Dublin, where [Norman] David was born on 7th January 1920. David retained a fond affection for Ireland all of his life, and for Dublin in particular. He often visited Ireland, to meet up with other relations (Todd family) and to enjoy the people, culture and history. David Butcher trained as an Accountant and spent much of his working life with British manufacturing company Goring-Kerr, retiring as a Director in July 1987. He lived in the Windsor area and was a passionate amateur actor, performing for over 40 years with the Windsor Theatre Guild, where he also acted as Treasurer (& Chairman?). He inherited his love of the theatre from his Aunt May Levey who was also an amateur thespian. 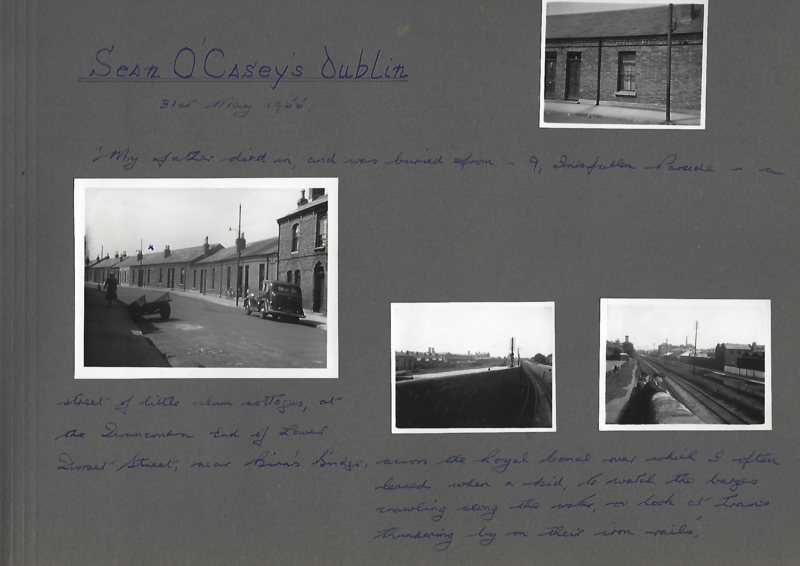 His love of literature and his love of Dublin, appears to have come together in his interest in Sean O’Casey’s work. 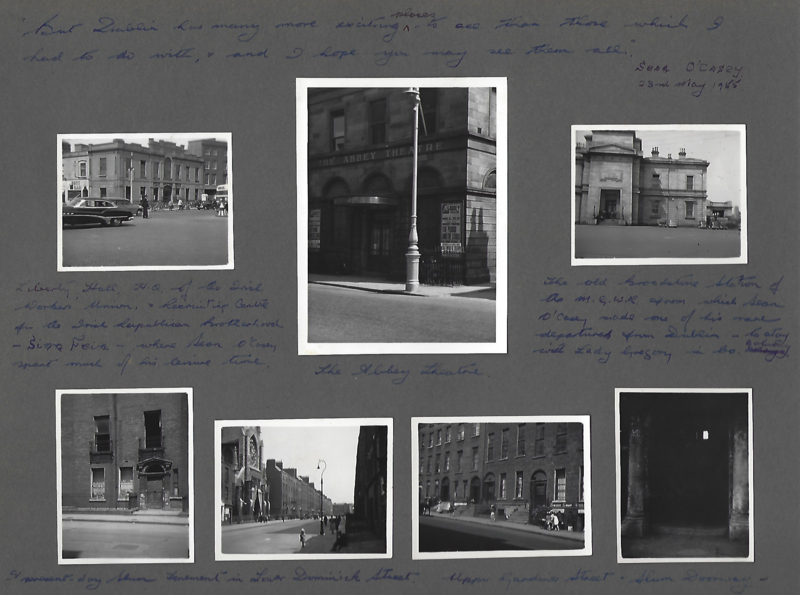 He had read the writer’s autobiographies, corresponded with him, and photographed locations which were significant in O’Casey’s Dublin life and inspiration. David attended a 1995 performance of Juno and the Paycock in Dublin and was introduced to most of the cast by Tom McKenna. David, himself, performed roles in the play at least 2 or 3 times, including an amateur performance he organised in the late 1950s to raise funds for the rebuilding of Dublin’s Abbey Theatre. 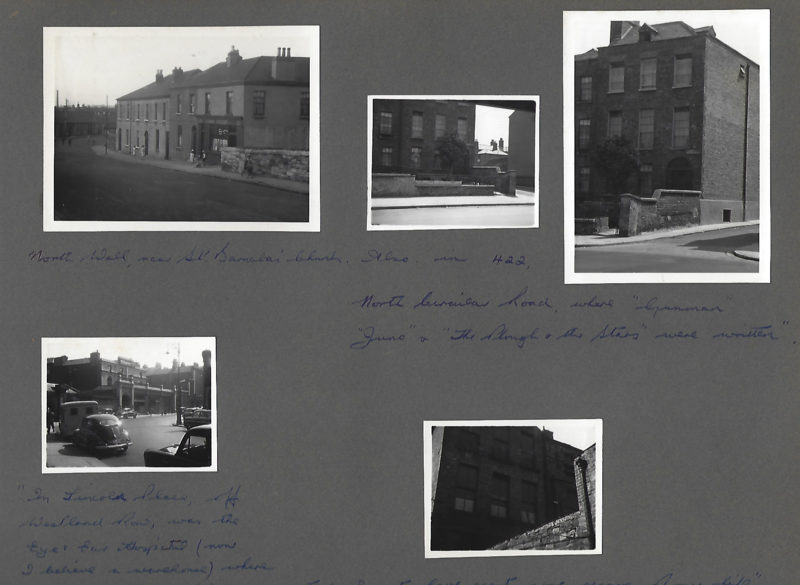 The following are pages from David Butcher’s album containing his letter from Sean O’Casey and his photographs and record of a trip to Dublin, in June 1956, to visit Sean’s old homes and to see the Abbey Theatre’s production of Juno and the Paycock. 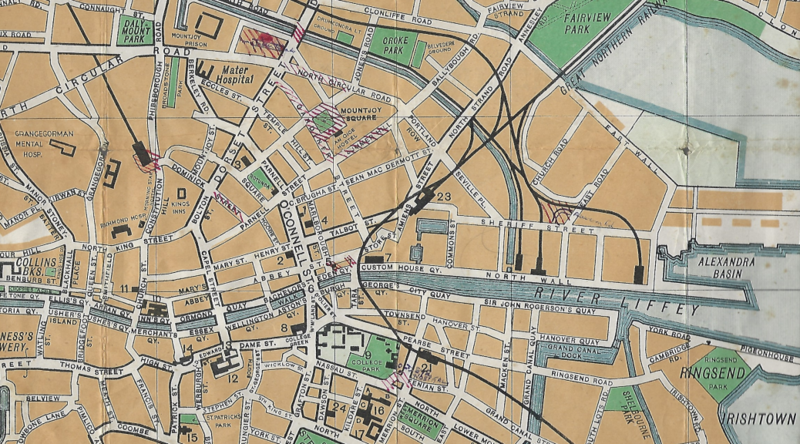 He tracked down the locations Sean described to him of where he had lived in Dublin. David also ventured out to explore more of the city and caused a sensation with his camera it seems. 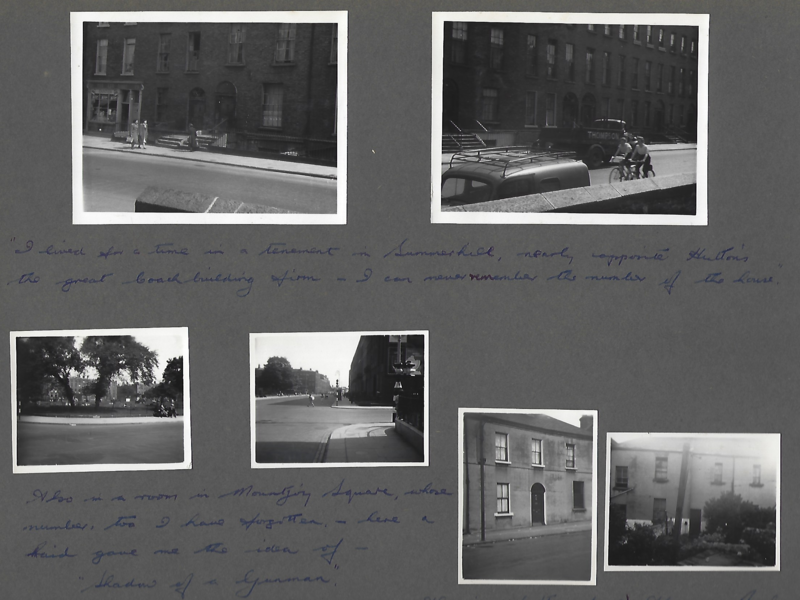 “I lived for a time in a tenement in Summerhill, nearly opposite Hutton’s the great coach building firm – I can never remember the number of the house.” “Also in a room in Mountjoy Square, whose number, too I have forgotten. – here a raid gave me the idea of – “Shadow of a Gunman”. Also in 4 (afterwards 18), Abercorn Road. In Abercorn Road, North Wall, the camera soon attracted an audience, wanting to be photographed – with Ingrid Berhenleir. News soon spread, & within a few minutes another photograph! 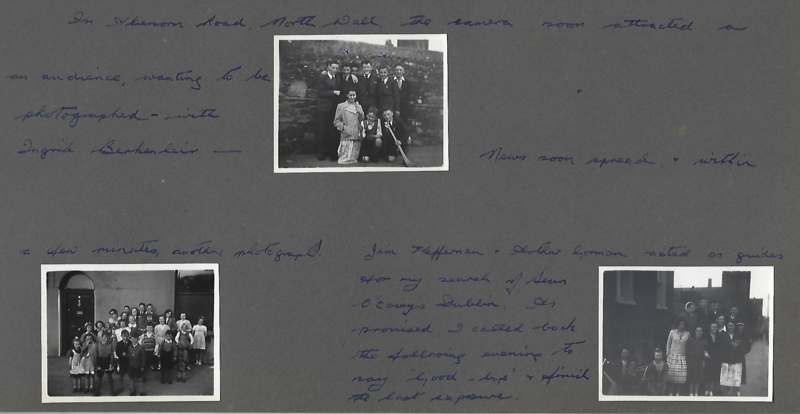 Jim Heffernan & Arthur Gorman acted as guides for my search of Sean O’Casey’s Dublin. As promised, I called back the following evening to say “Good-bye” & finish the last exposure.